Buy best personalized birthday gifts for brother from sister. 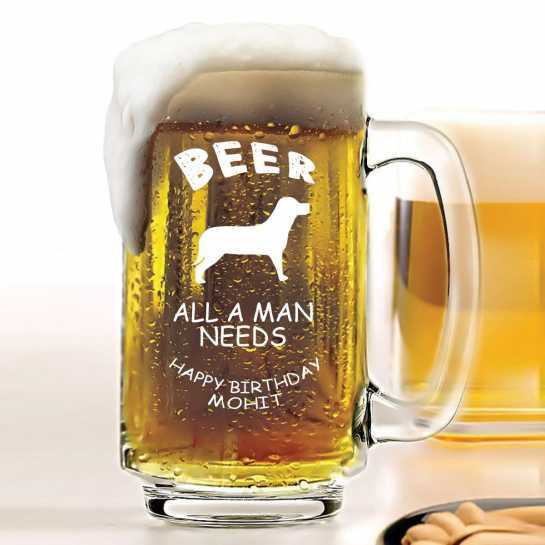 Birthday gifts like beer mugs with name, best brother photo frames, magnets and more. Shop online with pan India delivery. Every year on his birthday, you look for a gift that can really cheer him up, surprise him and make him appreciate you as a sister/brother even more. At dezains® you will get a variety of birthday gifts for brother. Here are few quick buy options - the best designs in each category! This is a very stylish coffee mug designed for your brother. A conventional, or in certain context a funny Hindi word - Bhaisaab is printed in bold letters. A short message like - Happy Birthday 17.03, or love you brother, can be added to the design. On the other side of the mug, a make belief word - Brotherosarus will be printed in the silhouette of a dinosaur to give the mug a very creative look and feel. World's best brother will be printed in big and block letters on one side of the mug, and another side will have three photo collage, with a superman symbol at the center to signify that the person in the photo is a super-person. Every brother should have at least one of these kinds of a mug, a mug gifted by sister to brother, with a personalized message or a quote. Quality mug at a reasonable price! Your brother is no less than a king. Gift him this creative coffee mug - which says - Kings are born in - and add his birthday month! Throw in two of his photos in the design which will add to the appeal of this coffee mug. Isn't these designs extraordinary and very different from boring designs that you see everywhere? Dezains takes pride in creating beautiful templates and designs, which appeals to senses! On your brother's birthday, gift him this custom etched beer mugs. Let him celebrate the day, by enjoying a chilled beer in the personalized beer mug gifted to him by his sister/brother. His name, along with a superhuman figure and 'super brother' will be etched on the beer mug as shown in the template. Your brother is going to love this gift on his birthday. Send this 'brother full form' beer mug to your dear brother on his birthday. He has turned 18 or 21, and as a gesture to show that he is all grown up now, and can enjoy few drinks now and then, gift him this personalized beer mug. Each letter of the word Brother has been associated with a nice adjective, and this one is just the perfect birthday gift for him. Plane and simple engraved beer mug for your brother's birthday. On his birthday just tell him that he is the best brother ever. No drama, nothing! Add his name for the extra personalization touch to the beer mug. A branded beer mug with personalized engraving is a popular and useful gift. This will add to his collection of bar accessories and glasses. A3 sized photo collage frame with multiple photo options. It's better to send us as many photos as you can to create this super mix up and collage photo frame. Pick up his childhood photos, school/college photos, as well as the recent pictures, to create magic. Your brother is going to super like this awesome photo frame. "I will always love you Bhai" - framed photo print for your brother. This design asks for three photos of your brother - one of his early childhood days, one the most recent one, and one during sometime in between. These photos will have the year mentioned, along with the message. The size of the frame is A3, and it will look good being hung on the wall! 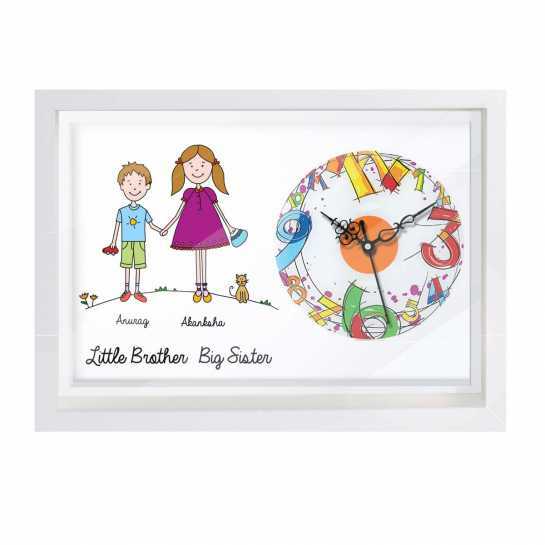 A creative and texty wall art for brother and sister, framed in a beautiful A3 sized frame. This one will look good along with other photo frames that your brother might have in his room. It comes with standard text, with the name of siblings at the bottom. However, you can customize the text as per your need. A perfect b'day gift for a brother. On his birthday surprise him with a caricature gift. The artist draws caricature face based on the photos you send. This is used on the caricature theme of your choice to create a personalized artwork for you. Its printed and framed to make it a creative wall hanging. Pricing is bit on the higher side due to the complexity, but the product deserves and definitely stands out. There are multiple themes, you could choose for your brother. If he is a cricket fan, you can select a cricketer them. If he is a football fan, you can show him playing football on the field. Use your imagination, to create the best surprise gift for your brother. Two cushions, and both of them are personalized. 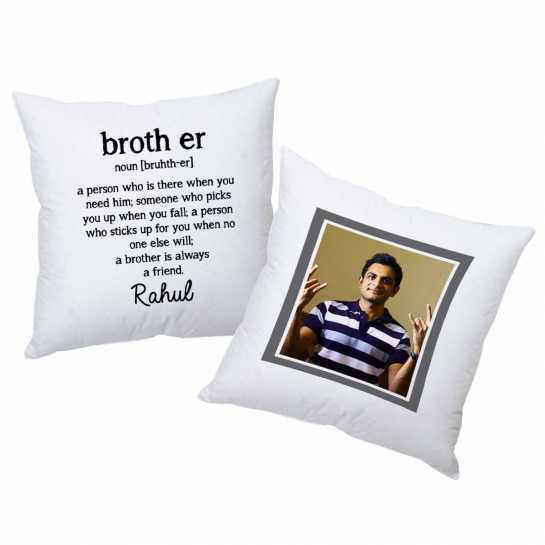 One will have text describing who a brother is (you can request to change the text) with your brother’s name on cushion. And the other will have his photo graph or any artwork you wish. On his birthday, this gift stands out, as it reflects your love and emotion, and not just ‘buy and send a gift’ kind of gift. It’s a special gift for your brother. These cushions are soft, of good quality, and will perfectly fit on the living room sofa. It can also be used on the study room chair. If your brother works for long hours, its a gift he can hug tightly to! Send your brother cool gift on his birthday. Get this beer mug, with the birthday message and his name engraved on it. Add his birth date, sun sign or anything you wish. The engraved glasses look classy, and he will love the gift for sure. To, the best brother in the world, on his birthday, gift these engraved bar accessories. Not just beer mugs, but we have wine glasses, whiskey glasses and champagne glasses. Depending on how old he is, you can select between beer glasses, for younger brother, or a set of whiskey glasses for elder brother. It’s a simple and sweet gift for your brother under budget. 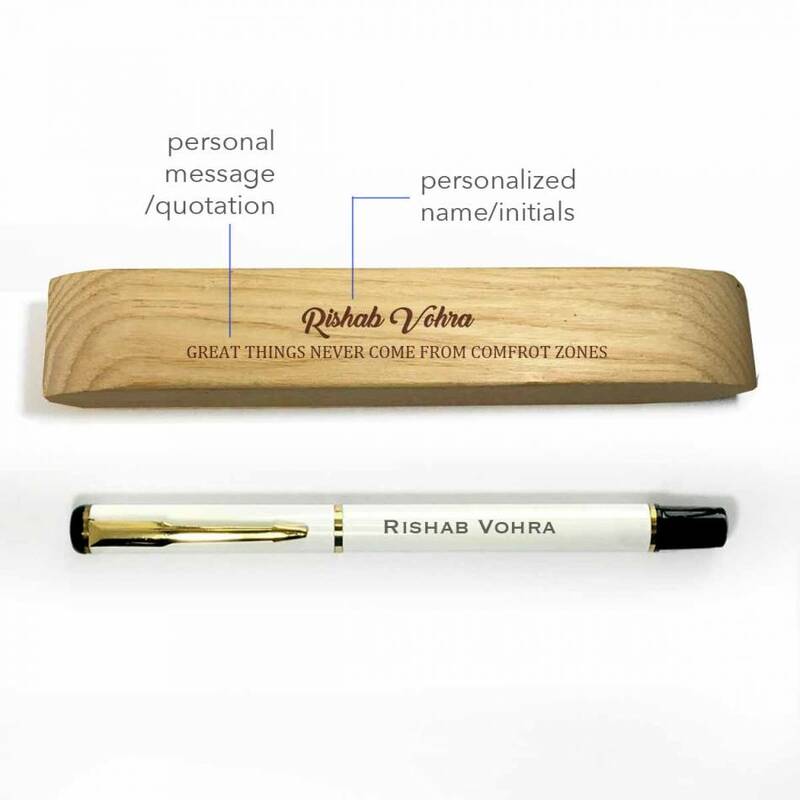 Gift his this pen on his birthday with his name or birthday engraved on it. It comes with a box, which can also be personalized with text and quotes! 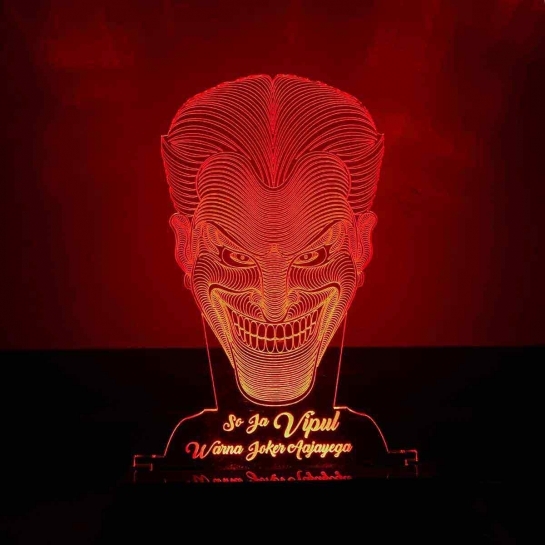 Your brother will love this interesting night lamp, especially if he is a batman and joker fan. The engraved night lamp gives a really cool effect on the wall or background behind it. The lights are LED and operate on AC source. Get a message engraved on it and wish your brother a very happy birthday! We deliver gifts all across India, and free shipping for orders above Rs 999. You can club multiple gifts and gift to him, to show extra love. Make his birthday extra special and fun by sending these personalised gifts. It’s a vibrant wall clock, with brother and sister themed design. Get your name written on it to make it yours and gift to your brother on his coming birthday. This will look very nice hanging on one of the wall of his room. A useful and personalized gift that you can gift to your brother on any occasion actually. Buying things online has become a trend now, with so many e-commerce websites that have sprung up. Trust has become a major issue now. Be careful in selecting the right online store, before you blindly buy the products and trust timely delivery. Dezains is in the e-commerce space since last 10 years and has been gaining popularity ever since. If you are staying abroad, and want to gift your sibling who stays in India, you can easily place the order online for him from our website. We create high-quality products and have many designs with the birthday themed designs for elder/younger brother. If 'personalized gift' is your thing, you are in the right place. Choose from the wide range of products that we offer, including photo mugs, magnets, frames, posters, t-shirts, beer mugs, whiskey glasses, cushions, pen, wall clocks, and many other creative presents. Brother birthday gifts range from price as low as Rs. 299 to as high as Rs. 5999. You get each and every gift personalized and gift wrapped for the occasion. Show your elder brother/brother-in-law that you can take the extra effort to find the best gift for him. Most people find it a daunting task to find the perfect gift for their sibling. 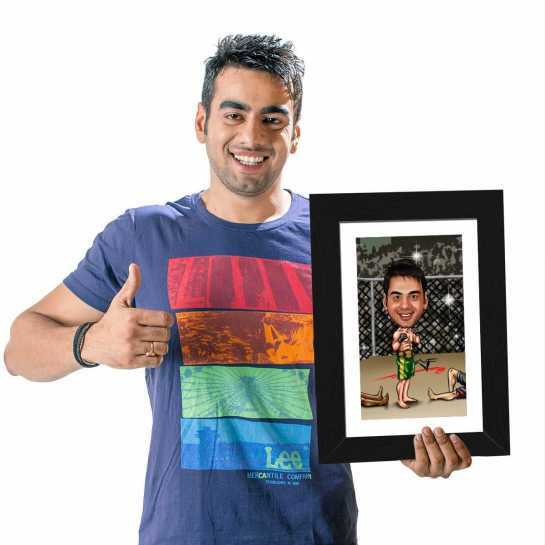 If you are looking for some really out of the box gifts, you should go for the caricature products. A team of caricature artist will hand draw the face, and this cartoonish art can be used to create t-shirts, mugs, and mind-blowing wall arts. There are certain birthday combo gifts for the brother that you should definitely have a look at. There are sure to surprise him on his birthday. All these products are of very good quality and are custom made in India, based on your details. Being an elder sibling you must have had a wonderful time pulling your younger brother's leg. You must have shared so many memories together, and no matter how old he becomes, he will always be your younger brother. You are his best friend, his role model, and he looks up to you. Find out the best birthday present ideas for him on his 18th birthday or the 21st birthday, or the 20th birthday. Give gifts which are unique, creative, and impressive. He is turning 18, and you would want to gift him something which relates to the transition he is going through, won't you? 18 is a significant age in a person's life, and one should choose wisely what to gift. Get some interesting ideas to make his special birthday worth remembering. No gift could replace the one that you have created on your own, no matter how bad are your artistic skills. There are tons of homemade birthday gift ideas for brother, only if you have time to make it for him. If you pull this off, tears are sure to fall from your brother's eye - tears of joy and love. Family comes first, and brothers will always each others' best friend and pillar of support. Good luck creating some really cool stuff for your brother to surprise him on his birthday! Chances like these come but just once a year.